TerpCreek is having a contest. 2. Click comments and answer this question. 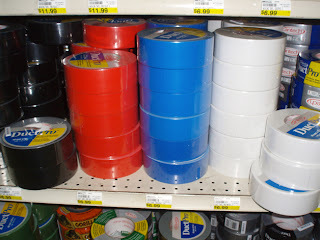 What do you use duct tape for? This will be a lot of fun because there are so many uses for duct tape! To get the ball rolling here is 1 way I use duct tape. I use it to remove lint or pet hair. Just rip it off 8 to 10 inches and roll it inside out and press on your sweater to remove link or pet hair. Works great! Once you are a follower you can enter as may times as you want but each time has to be a new idea or use of duct tape. Each entry will be numbered then a number will be picked randomly. There will be 1 winner for every 100 ideas in the comments. Remember only one idea per comment. 100 Barns in 100 Days is going great. 100 Barns in 100 Days is going great. I am keeping up very well with all the drawings. Hope you are checking out eBay every day for the new barn drawing. Just go to eBay and type TerpCreek in the eBay search box. I got the OK from the Detroit client to proceed with the large 15-foot backdrop for a car showcase. So I am back to work on that. 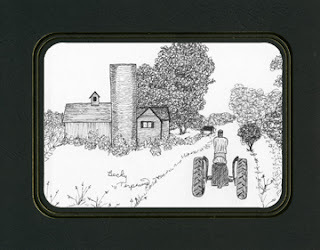 I have committed to draw 2 pen and ink for the Freeport Museum and 3 for the Buchanan Art Center. Email me or leave a comment if you want to be a member of the Barn Lovers. It is free to join. You will receive a free gift and first chance on barn items. The third barn is listed on ebay! Go to ebay and type TerpCreek in the ebay search box. 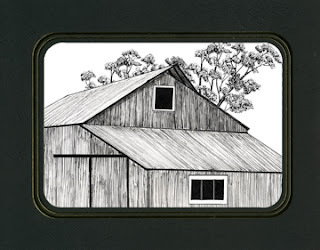 This 100 original barn drawings in 100 days is starting a buzz. It is generating lots of interest. 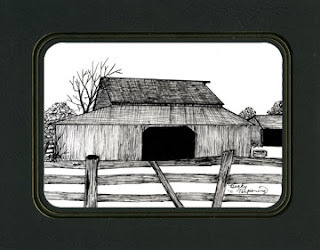 I am getting more custom orders for larger drawings of barns. I am getting so excited! I am also running a Pet Portrait Promotion. If you have a cute pet that you dearly love then this is the perfect time to take advantage of a half price drawing. The pets I draw for this promotion will be entered into a calendar drawing. 12 of the drawings will appear on a 2012 calendar. Deadline for the Pet Portraits Calendar is July 15, 2011. 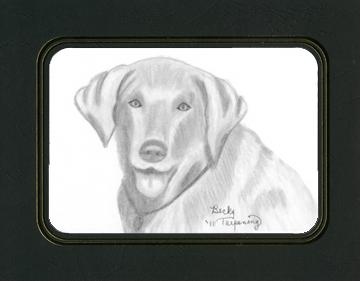 The Pet Portrait Promotion is for a matted 5"x7" pencil drawing of your loving pet for only $75 which is half price ($150 Value). Hurry offer ends August 31, 2011. Barn #2 is listed on eBay. Just go the eBay search box and type in TerpCreek and that should take you right to the barns. Not all the barns have titles but this one is titled "Going Home". It is not to late to join the Barn Lovers and it is free. Just email at Becky@TerpCreek.com and put Barn Lovers in the subject line. Hurry and join because the first Barn Lovers free gift comes out next week. Well I better go draw more barns. Only 98 more left to draw. The first barn of 100 barns in 100 days is listed on ebay. Just go to ebay and type TerpCreek in the search box. There is still time to join the Barn Lovers and get in on the free gifts. First gift is next week so join today. It is free to join the Barn Lovers email me at Becky@TerpCreek.com with Barn Lovers in the subject line. That is all there is to it and I will not sell your email address. You will receiving free gifts and once a week you will get first chance to buy a barn from the 100 barns in 100 days before it goes to ebay auction. So get excited and go to ebay and start bidding.